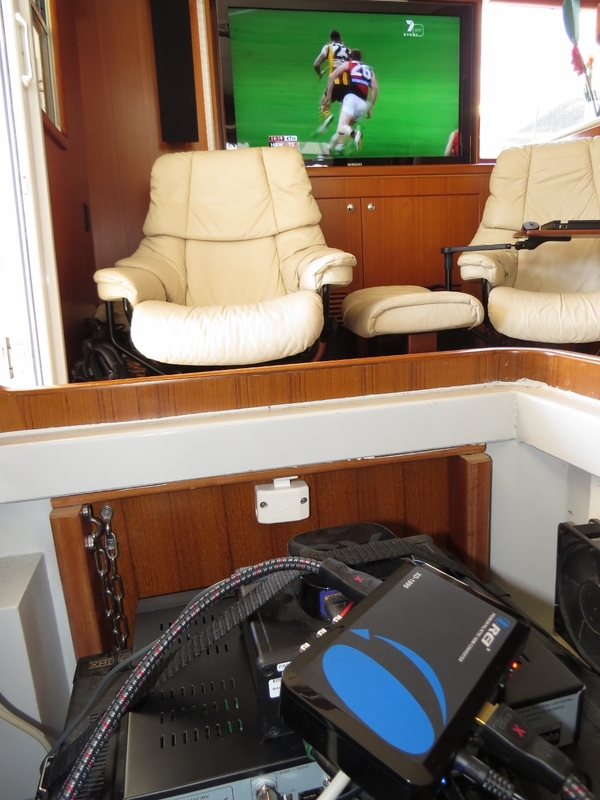 Dirona has a KVH M7 satellite TV system installed. When we left Hawaii, we cancelled our satellite TV subscription with Dish Network and haven’t used the system since. We knew we had some work to do to get the system running outside the US, and it hadn’t been a priority. It also wasn’t even a possibility until we got to New Zealand and in range of the television satellite there. The only time we’d really missed it was for live sporting events. We were in Fiordland during the Superbowl and, with our 64kbps data connection, we had trouble getting a reliable audio feed, let alone a video feed. 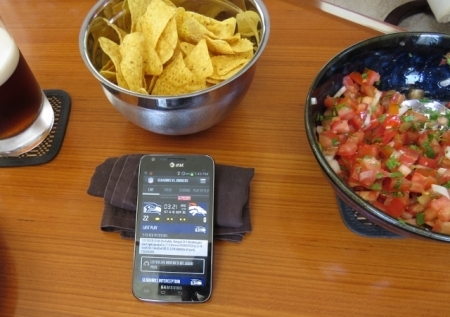 We made do, and actually had a great time, “watching” the game over a mobile play-by-play app. We’re not sure if this was a step backwards to a time before television, or a step forwards, but as Seahawks fans it definitely was among the most enjoyable Super Bowl we’ve ever watched. Since we plan to be in Australia for over a year, getting the system functioning here felt worth the time investment. The first stage was to climb the stack to replace the circular Low Noise Block (LNB) at the satellite television antenna with a linear LNB. Circular LNBs are used in the US, Canada, Latin America and some parts of Asia. 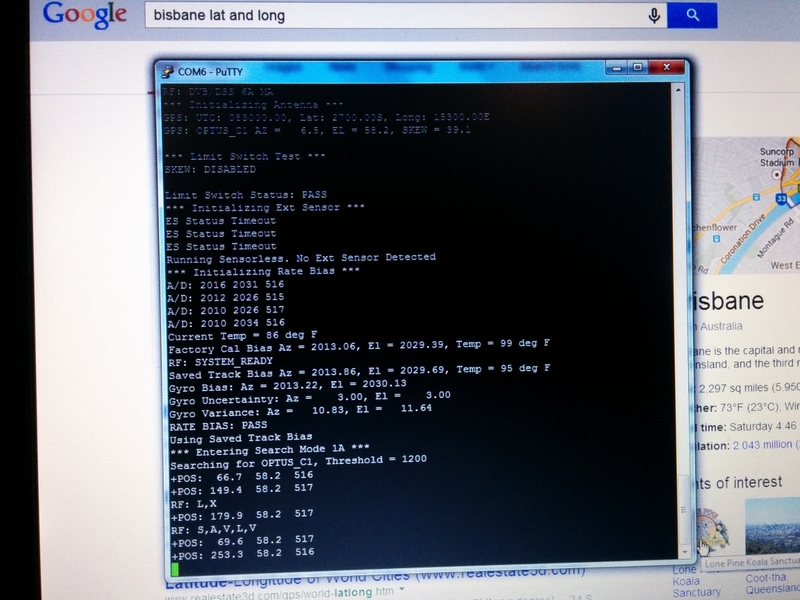 Linear LNBs are used in Mexico, Europe, Australia and New Zealand. 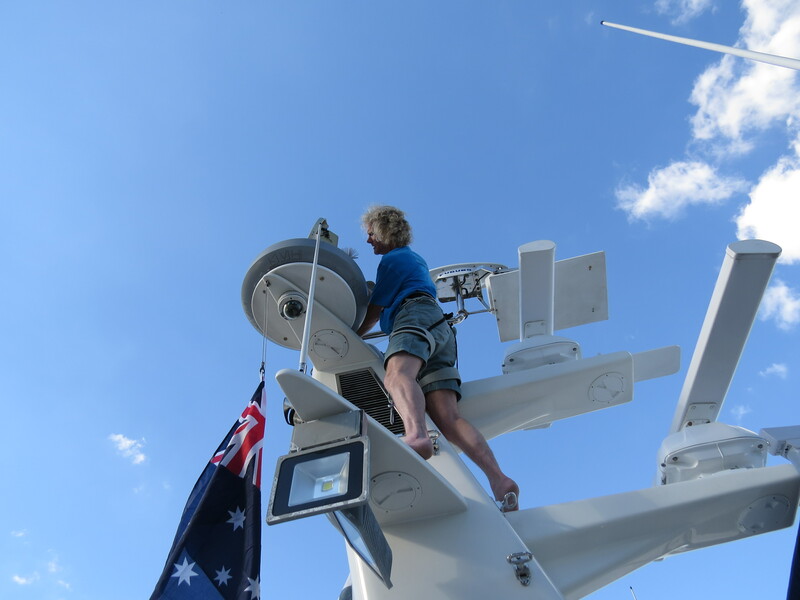 We had purchased a linear LNB when we bought the satellite TV system–this was among of the last few pieces of equipment that we carried for worldwide cruising but had not yet used. While up the stack, we also adjusted the skew angle on the LNB. Periodically, in different parts of Australia, we’ll need to repeat this adjustment. 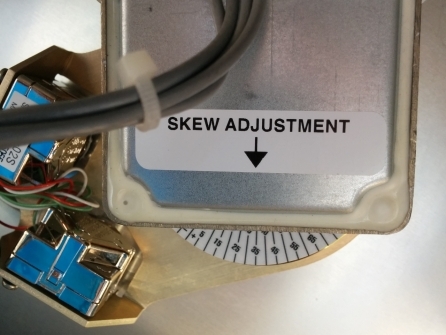 Circular LNBs don’t require this adjustment, and newer M7 models can automatically adjust the linear LNB skew angle. 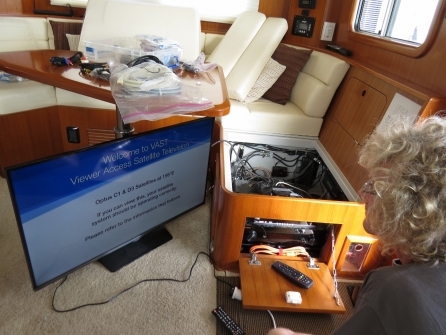 The next stage was to install an Australian digital receiver. 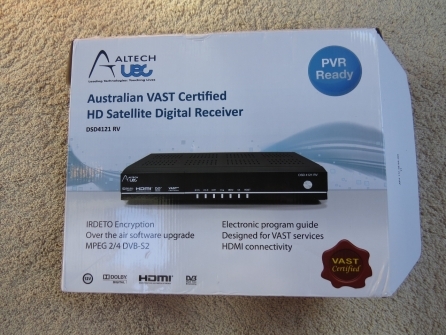 The Australian government has established a free commercial satellite system: Viewer Access Satellite Television (VAST), for viewers in remote locations or those who cannot receive terrestrial services after the digital switch-over. Travelers, such as those in RVs or boats, also are eligible to use the system. The satellite frequencies had changed since our system was delivered, so we needed to reprogram them into the satellite dish. This allows the VAST receiver to find the satellite. At this point in the process, we still couldn’t display anything on our TV. The VAST receiver outputs a PAL-format video signal, the standard used outside the Americas, whereas all our AV equipment requires NTSC. 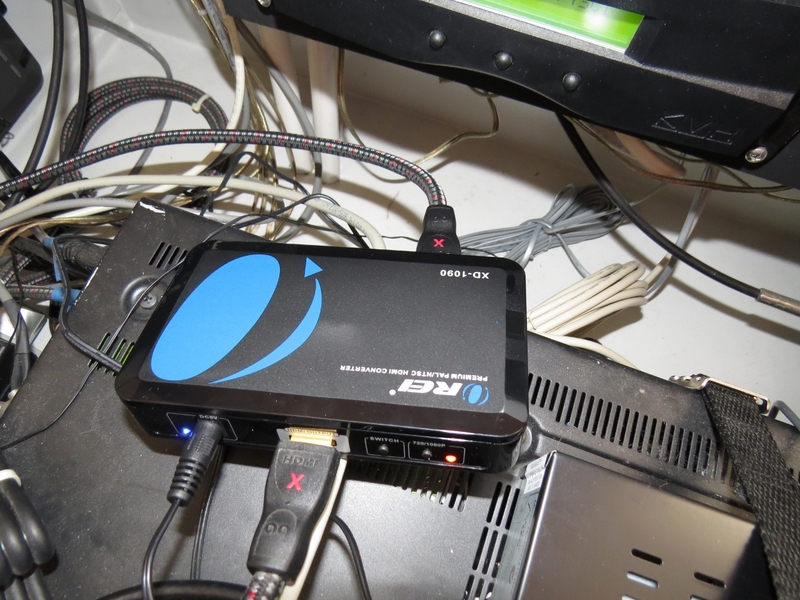 We ordered a Orei XD-1090 PAL-to-NTSC converter from Amazon with an expected delivery time of two to three weeks. 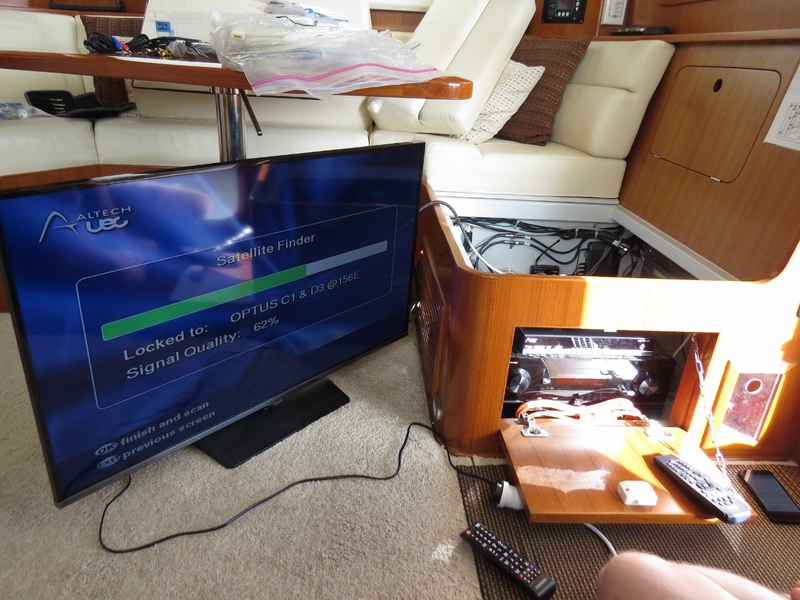 While we waited for the converter, Mark Mohler of N62 Gray Matter next door lent us his PAL-format television so we could test our setup end-to-end. The receiver quickly found the Optus C1 satellite and successfully established a connection. With a single satellite to find, this stage was much faster than the Dish Network satellite TV system we’d used in the US. We’ve spent way too much time with the “Searching for Satellite” screen up as the Dish receiver struggled to locate one of the multiple Dish satellites. We soon had the system running end-to-end. Spitfire seemed to be particularly missing TV. The last piece of the puzzle, an Orei XD-1090 PAL-to-NTSC converter, finally arrived. And amazingly, it just worked. Equally amazing, Amazon shipped the unit to Brisbane from the US in less than two weeks for only $8 shipping. We got to enjoying many Australian sports pretty fast. 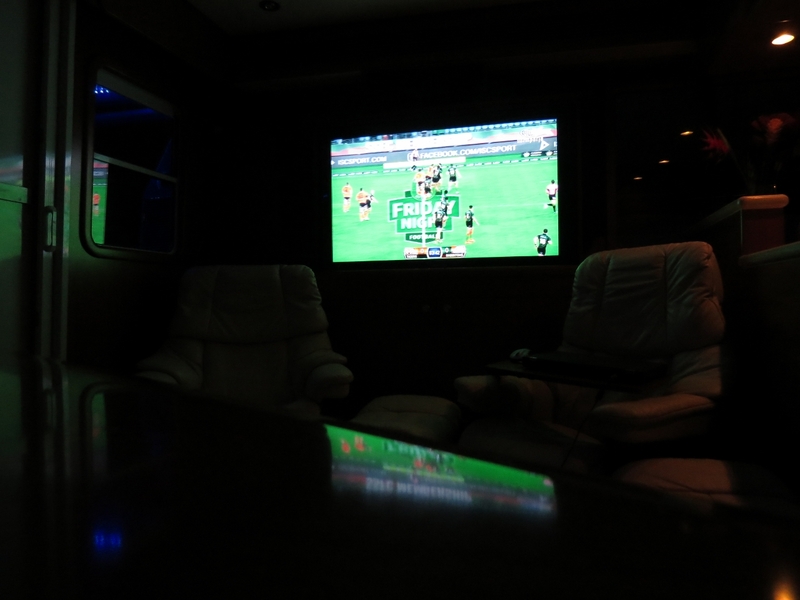 In New Zealand we started watching Rugby League play and were enjoying it. As we arrived into Brisbane, many friends from the area said “you have to watch the Game of Origin.” Were they ever right. We’re used to allstar games that really aren’t very serious and really aren’t played very hard like the NFLs Probowl. As you know, Game of Origin is completely different. Amazing levels of talent and a very hard faught game. Having watched those three games, we got to know the players and end up wachting and enjoying the regular league play. We watched a few Australian Rules Football games and enjoyed them but never really became fans. Where we completely failed, was cricket. We just could’t get excited about it. A New Zealand friend of mine was saying we were nuts not to be watching Cricket and I pointed out that any game where the grass growth on the pitch out paces the game, isn’t an ideal match for us. 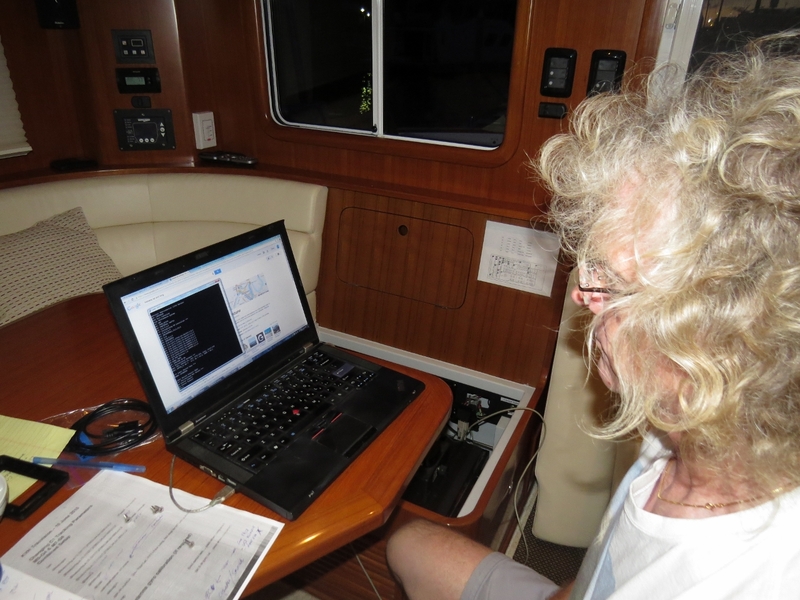 He countered “this from a couple that cruises the world at 8kts?” Admittedly, he had a point :-). Greg asked what channels we recieve on the VAST system. There are about 20 different channels and various radio stations as well. The current channels and scheddule is posted at: http://www.sattvguide.com.au/?id=3. 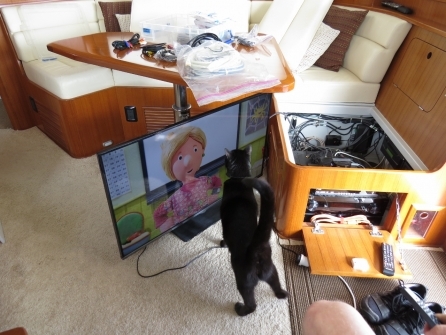 We have been avid watchers of your site since you took delivery of the boat. We will look out for you if you cruise down to the Gold Coast. One question – what television channels do you receive with the VAST system? A local buddy had directed me to lyngsat for future travels and I will take your advice and his for that. The VAST system we are using in Australia is no charge other than for the decoder so we are well covered here. Using free to air sats, request the M7 to be directly programmed to the sat and downlinq frequencies. But, having done it once for the VAST systems, I suspect I could do it fairly easily for others. Thanks for the tip on Lynqsat.com. Hi Chris. Yes, we do like the LED lights. We initially got the boat with 1500W hallogen light looking forward and 2 on the boat deck. 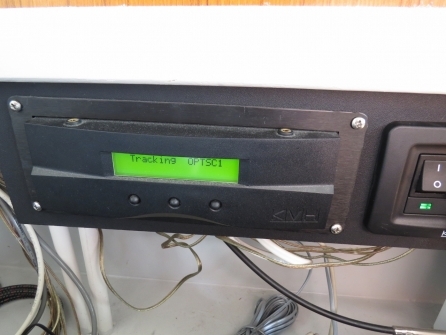 We added 2 LED flood lights on the side to get a visual reference on the channel edge when operating close to shore at night and to iluminuate the area around the boat when needed for work. We went with LED because we didn’t have the power headroom for more hallogens. The LEDs are less than 1/5 the power and nearly the same brightness. We left the forward halogen light in place but changed both boat deck lights with LED to reduce power consumption. When we had all three 500W lights on, we were drawing nearly 14A. The only downside of these LED lights is the brackets will rust if operating in tough conditions. It’ll take a year or two but they will eventually rust. So replaced the brackets with stainless steel. The ligths have been on Dirona for years and continue to operate reliably. The price is unbeatable at US$95 and we really like them. How do you like those LED 100W lights? I have been thinking of getting a few as well. Are they holding up good with the salt water/air? Do you get cool or warm white? James, with your explanation, I now realize that it’s the side-facing flood light. I must admit that when I first looked at the picture (and wrote my initial query), my mind’s eye merged the boat deck flood and the side light into one part. Now that you’ve told me it’s the side light, I can see it more clearly. I think what partly confused me was the yellowish element in the middle; for some reason that just didn’t reconcile. Is it an LED? I’m not sure what you are referring to Cedric. In the picture at the stack, directly below my left foot is a pie eye that allows service access to the wires inside the lower stack wing. Outside of the pie eye is a a rearward facing boat deck flood light and outside that is a side facing flood light. On the right side of my left foot lower down the stack than the winglet I’m standing upon is a fold-out step to allow easy climbing of the stack. What is the device below your left foot when you’re standing on the stack at the M3? It looks like a feedhorn, but not. Thought that I’d seen it all, but this one confused the heck out of me.